The Seaford Wetlands comprise of a number of vegetation communities. The tall, Common Reed (Phragmites australis) dominated marsh in the background provides potential habitat of the internationally endangered Australasian Bittern (Botaurus poiciloptilus). As a newcomer to Melbourne, I had set expectations on what wildlife I might observe inhabiting the urban jungle. I anticipated that the city would support little in the way of indigenous fauna and that any wild places would be long since lost. Having lived within the city for a few months now, these presumptions have been turned on their head; Melbourne certainly is home to many native critters, and plenty of significant wild places continue to exist within the city’s boundaries. One such wild place I have had the pleasure of visiting recently is the Seaford Wetlands - a truly remarkable remnant of the past preserved in the heart of suburbia. The wetlands are a mecca for birdwatchers, a diverse array of around 190 species having been recorded here. Migratory waders are particularly well represented, with 18 such species making use of the reserve. Sharp-tailed Sandpiper (Calidris acuminate) alight the mudflats in their thousands throughout the summer months where they forage for freshwater invertebrates and their larvae before departing for their Siberian breeding grounds during March. Indeed the Seaford Wetlands, along with the nearby Edithvale Wetlands, support more than 1% of the Sharp-tailed Sandpiper’s flyaway population. For this reason, the wetlands are recognised as internationally significant and are therefore protected under the Ramsar convention *. The reserve supports not only migratory species, but also a number of threatened species. The wetlands account for one of a few known potential-breeding sites of the endangered Australasian Bittern (Botaurus poiciloptilus). This secretive, nocturnal, heron-like bird inhabits the tall, dense, common reed and cumbungi-dominated marsh of the wetlands. As a result of this behaviour, along with the species’ incredibly cryptic plumage, it is unlikely that one would sight the bird whilst visiting. Nevertheless, it is exciting to know that such a rare species lurks within the reed beds. The critically endangered Orange-bellied Parrot (Neophema chrysogaster) and endangered Swift Parrot (Lathamus discolour) are amongst 15 other threatened birds that have also been sighted visiting the wetlands. Aside from these particularly notable species, a multitude of relatively common birds reside at the wetlands. Around the reserve’s outskirts, Noisy Miner, Little and Red Wattlebird, various Honeyeaters and Rainbow Lorikeet browse on flowering eucalypts and banksias whilst Silvereye and Superb Blue Wren forage amongst the shrubs beneath. Eurasian Coot and Purple Swamp Hen go about their business amongst the reed bed peripheries with Egret, White-faced Heron and White Ibis stalking along the water’s edge. On the open water, ducks are particularly prominent. Whilst visiting, Chestnut Teal, Grey Teal, Black Duck and Pink-eared Duck were all seen in good numbers along with a splattering of Hoary-headed Grebe. Above the wetlands, Welcome Swallow dip and dive over the water as Little Eagle patrol from far above on thermal columns. Perhaps the most exciting sighting of the day was observing Golden Headed Cisticolas bopping around in the tall marsh along the centre track. The nervous little birds were clearly not impressed by my presence and, with a series of scolding tweets, retreated further into the reeds. A male Chestnut Teal (Anas castanea) relaxes perched on a log, its sleek plumage gleaming in the sunshine. A bird-watching platform at the southern end of the wetlands provide a good opportunity to observe many such birds. A multitude of duck species occur at the Seaford Wetlands. The Pacific Black Duck (Anas superciliosa) are among the most common. A Golden-headed Cisticola (Cisticola exilis) retreats into the marsh upon being disturbed. Those with a keen interest in plants shall also be impressed. Eleven vegetation communities are represented within the wetlands, five of which are considered threatened at a state level. The diverse array of birds inhabiting the wetlands can be directly attributed to the quality and diversity of these communities. Similarly, the presence of frogs within these vegetation communities indicates that the wetlands are in a healthy state. 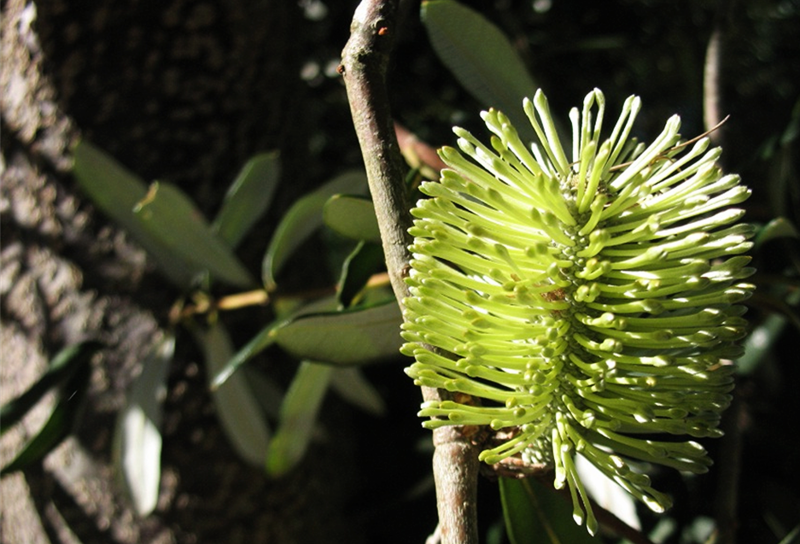 Flowering Coast Banksia (Banksia integrifolia) provide a much relished food source for the many resident Wattlebird, Honeyeater and Rainbow Lorikeet around the edge of the reserve. Due to the close proximity of Seaford to central Melbourne, it might well prove to be the perfect location for your next nature outing. Approximately an hour’s train journey from Flinders Street Station along the Frankston metro-line, the Seaford Wetlands can be easily accessed within ten minutes on foot via McKenzie Street to the east of the station. So there you have it - a wetland of universal importance supporting numerous endangered and migratory species within a metropolitan area. Certainly an interesting and inspiring example of how human and wild communities can coexist and thrive into the future. * The Ramsar Convention on Wetlands is an intergovernmental treaty which aims to conserve wetlands of particular importance by ensuring that they are managed sustainably. Although only a small remnant of the past 52 square kilometre Carrum Carrum Swamp, the Seaford Wetland Reserve is still significantly large, covering approximately 158 hectares.